Patricia Harris was born in Mattoon, Illinois. She graduated from Howard University in 1945 with a bachelor's degree in political science and economics. 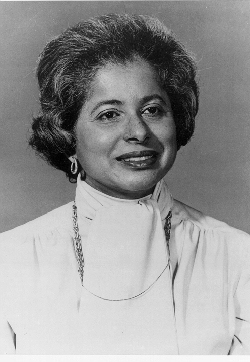 Following graduation, Mrs. Harris went to work for the Chicago Young Women's Christian Association (1946-1949), then became assistant director for the American Council for Human Rights (1949-1953), and executive director of Delta Sigma Theta (1953-1959). After graduating from law school she went to work for the criminal division of the U.S. Department of Justice for about a year before joining the facility of Howard University Law School in 1961. In 1965, Mrs. Harris was appointed ambassador to Luxembourg by President Lyndon Johnson. She served in this capacity until 1967 when she returned to Howard University as a law professor. In 1970, she joined a Washington, D.C. law firm, practicing corporate law until she was appointed U.S. Secretary of Housing and Urban Development by President Jimmy Carter in 1977, a position she held until 1979, when she became Secretary of Health, Education, and Welfare. During her tenure, the department was renamed Health and Human Services. After Jimmy Carter was defeated in his bid for a second presidential term, Mrs. Harris resigned as Secretary of DHHS in 1981.